Golf fans around the world look forward to the Masters Tournament at Augusta National Golf Club and for the 12th year, ESPN will air live play of the first and second rounds of the Tournament. ESPN will surround the telecasts with live SportsCenter at the Masters programs as well as news, information and analysis on television, radio and digital platforms for the entire week of the event. ESPN and ESPN Deportes will air live action from the first and second rounds on Thursday, April 11, and Friday, April 12, from 3-7:30 p.m. ET with an edited encore presentation in prime time each night from 8-11 p.m. on ESPN. Scott Van Pelt will host ESPN’s Thursday and Friday telecasts from Augusta National’s Butler Cabin with ESPN golf analyst Curtis Strange. Van Pelt, Strange and Tom Rinaldi, who will conduct player interviews, will join CBS’ golf announcer crew for the telecasts. ESPN also will air the traditional Masters Par 3 Contest on Wednesday, April 10, from 3-5 p.m. with a special one-hour lead-in program at 2 p.m. across all Masters Digital platforms and on ESPN+. Dedicated SportsCenter at the Masters programs begin on Wednesday (noon – 3 p.m. and 5-6 p.m.) and continue Thursday-Friday (10 a.m. – 3 p.m.) on ESPN. Prior to the live television windows Thursday and Friday, SportsCenter will be the premier destination for golf fans to receive their live Masters updates, including highlights of play, with updates airing between 8-10 a.m. on SportsCenter:AM prior to the 10 a.m. programs. Sage Steele and Van Pelt will be lead anchors for the weekday SportsCenter segments with ESPN Get Up! host Mike Greenberg also anchoring segments and joining ESPN’s Masters coverage for the first time. This year ESPN is expanding Masters coverage with a half-hour social media preview program airing Wednesday, Thursday and Friday at 2:30 p.m. prior to the live telecasts. Hosted by Michael Collins, the program will air on the ESPN Twitter and YouTube channels. All Masters programming on ESPN and ESPN Deportes also will be streaming live on the ESPN App. ESPN began live telecasts of the first and second round of the Masters in 2008. Always a highlight of Masters week, the fun and family-oriented Masters Par 3 Contest will air Wednesday, April 10, from 3-5 p.m. on ESPN, with an encore telecast at 8 p.m. on ESPN2. An additional hour of Par 3 Contest coverage will be available from 2-3 p.m. across all Masters Digital platforms and ESPN+, which will lead into the ESPN telecast. The contest, which began in 1960 and includes current Masters invitees as well as past champions, creates many exciting moments on the Augusta National Par 3 course. Family and friends of players often serve as caddies. Sean McDonough will anchor the Par 3 Contest telecast along with analysts North and Strange. Rinaldi will conduct interviews. The event was first televised by ESPN in 2008. ESPN’s flagship news and information program SportsCenter will feature live updates from Augusta National Golf Club throughout the Masters Tournament beginning the morning of Monday, April 8, and continuing through the end of the event on Sunday, April 14. On the first two days of competition, Thursday and Friday, April 11-12, viewers will be kept up-to-date with multiple reports per hour on SportsCenter including in-progress highlights, scores and interviews on SportsCenter:AM from 7-8 a.m. on ESPN and 8-10 a.m. on ESPN2. After that, a dedicated SportsCenter at the Masters program will air on ESPN from Augusta from 10 a.m. until ESPN’s telecast of live play begins at 3 p.m.
Thursday morning’s ceremonial first tee shot with legendary golfers Jack Nicklaus and Gary Player will air in the 8 a.m. hour of SportsCenter:AM on ESPN2. A one-hour SportsCenter at the Masters special will air Wednesday, April 10, at 5 p.m. on ESPN with a preview of the Tournament. Van Pelt will host with analysts Andy North and Strange, and reporters Rinaldi, Gene Wojciechowski and Marty Smith. Earlier on Wednesday, SportsCenter at the Masters will air from Augusta from noon-3 p.m. on ESPN, with reports in SportsCenter:AM until 10 a.m.
On Tuesday, April 9, the news conferences of several prominent players will be aired on SportsCenter, with the schedule for morning and afternoon sessions to be determined. Also, ESPN will report the Masters first-round groupings as soon as they are announced. SportsCenter will air on ESPNEWS from 1-5 p.m. In addition to Van Pelt, Steele and Greenberg, Michael Eaves and Matt Barrie will anchor SportsCenter reports from the Masters, joined by North, Strange, Rinaldi, Wojciechowski and Smith. Features and interviews will be part of SportsCenter coverage of the Masters, including conversations with Tiger Woods and Rory McIlroy and a feature on defending champion Patrick Reed. Also included will be a look back at how Tony Finau’s ankle injury after scoring an ace in last year’s Par 3 Contest didn’t stop him from powering through to finish tied for 10th in his first Masters. Legendary golf writer Dan Jenkins had a special relationship with the Masters. Three-time major winner Brooks Koepka looks for his first Masters win. The history of Augusta National Golf Club’s 15th Hole. The approach Bryson DeChambeau is taking for the Masters. Practice With a Purpose – how pros practice is much different from the average golfer. Would players prefer to be before, with or after Tiger Woods in groupings? ESPN Deportes, ESPN’s multimedia, Spanish-language sports brand dedicated to providing the widest variety of sports to the U.S. Hispanic sports fan, will have live television coverage of the first and second rounds of the Masters Tournament on Thursday and Friday, April 11-12, from 3-7:30 p.m. Francisco Aleman (analyst), Silvia Bertolaccini (play-by-play) and John Sutcliffe (player interviews) will describe the play from Augusta National Golf Club. Fernando Alvarez will host coverage from the ESPN Deportes studio. ESPN Deportes Radio will have live updates of the Masters during Zona ESPN (Monday-Friday, noon-2 p.m.). In addition, ESPNDeportes.com will offer extensive Masters coverage on its golf index page. News and analysis from writers Bob Harig, Michael Collins, Ian O’Connor and Mark Schlabach. Expert’s picks from across ESPN, predicting who will walk away with this year’s green jacket. A full ranking of every player in the field for the 2019 Masters. Not just 1-20 or 1-50. This will include every single player. Comprehensive looks at some of the biggest names in this year’s Masters — with features on former champion Tiger Woods, defending champion Patrick Reed and 2015 champion Jordan Spieth. New for this year at the Masters, ESPN will produce a 30-minute pre-Masters show for Twitter and YouTube hosted by ESPN.com senior golf writer Michael Collins. The program will begin at 2:30 p.m. and will lead into ESPN’s live television coverage at 3 p.m. Wednesday-Friday. Collins will provide analysis, interview guests and interact with fans on both social platforms throughout the show. Fans can watch on Twitter at twitter.com/espn and on YouTube at youtube.com/espn. ESPN’s morning program Get Up!, which airs from 8-10 a.m. ET Monday through Friday, will have live interviews from Augusta National with ESPN’s golf analysts and reporters during the week of the Masters. In addition, Get Up! host Mike Greenberg will be at the Masters and anchor some SportsCenter reports from the event. Golf fans can find an on-demand collection of official Masters Films from past events on ESPN+, the multi-sport, direct-to-consumer video service from The Walt Disney Company’s Direct-to-Consumer and International (DTCI) segment and ESPN. ESPN+ is available as an integrated part of the ESPN App (on mobile and connected devices) and ESPN.com. ESPN AudioGolic and Wingo, which airs on ESPN Radio from 6-10 a.m. weekdays with simulcasts on ESPN2 (6-8 a.m.) and ESPNEWS (6-10 a.m.), will have live interviews from Augusta National with ESPN’s golf analysts and reporters during the week. Other ESPN Radio programs also will have Masters discussion during the week of the Tournament. The Matty & The Caddie podcast, hosted by SportsCenter anchor Matt Barrie and ESPN.com senior golf writer Michael Collins, and available on ESPN.com, will also feature Masters previews and interviews. This year, 45 countries will see the Masters on ESPN’s international platforms and can follow the event on ESPN television, online, mobile and broadband platforms. A live 30-minute studio preview show will air prior to all four rounds of the Masters in Spanish-language Latin America. In Canada, TSN will air the first two rounds of the Masters and the Par 3 Contest live with same day re-airs in primetime of the third and final rounds; RDS will carry all four rounds and the Par 3 Contest live in French language. ca/RDS.ca digital platforms will stream exclusive live coverage of “Amen Corner,” a Featured Group of the day, plus Holes 15 and 16. ESPN Classic will feature 43 hours of highlights of past editions of the Masters in a two-day tribute leading up to ESPN’s live coverage of the event. The tribute begins Tuesday, April 9, at 8 p.m. with an airing of highlights of the 1960 Masters won by Arnold Palmer. Highlights of every Masters since 1963 will air consecutively starting at 9:18 p.m., running straight through until 3 p.m. on Thursday, April 11, when ESPN’s live coverage of the 2019 Masters begins. Patrick Reed’s triumph in the 2018 Tournament will close out the marathon. 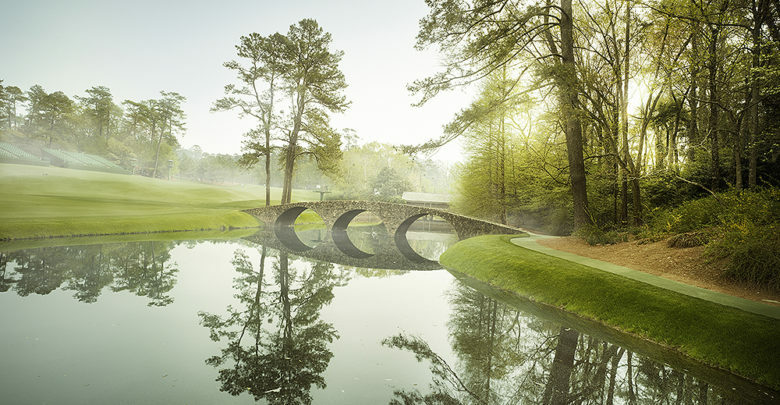 The Masters Tournament – Augusta National Golf Club, Augusta, Ga.